This is a Work for Hire agreement that works perfect for the music business. Though a little lengthy it covers ALL basis and ensures that the contract cannot be broken while also blocking loop holes that could degrade the integrity of the agreement. Perfect for producers that work with musician’, writers that work with vocalist, anyone transferring ownership to someone else, and all other popular work for hire purposes. The Text Explanation: Comes with a paragraph by paragraph document that quickly clarifies what each paragraph is saying. Perfect for someone that understands music basics. The Video Explanation: Comes with the text explanation and a video walking through line by line and stories about why certain paragraphs are important. Perfect for someone that wants a deep understanding or a person that would like to be transparent and watch the video with all parties involved. Unfortunately, we cannot offer refunds of downloadable products. Primarily because you cannot send the product back without owning it, and we have no way to delete it from your inbox. This website is operated by Sorrells Phase VI Inc.. Throughout the site, the terms “we”, “us” and “our” refer to Sorrells Phase VI Inc. Sorrells Phase VI Inc. offers this website, including all information, tools and services available from this site to you, the user, conditioned upon your acceptance of all terms, conditions, policies and notices stated here. This is a 360 Record Deal that mirrors what record deals look like in today's business. It covers ALL basis of a standard 360. -Has options to cut label in on merch and publishing opportunities. The Text Explanation: Comes with a paragraph by paragraph document that quickly clarifies what each paragraph is saying. Perfect for someone that understands music basics.The Video Explanation: Comes with the text explanation and a video walking through line by line and stories about why certain paragraphs are important. Perfect for someone that wants a deep understanding or a person that would like to be transparent and watch the video with all parties involved. We go through LINE-BY-LINE and explain the whole thing. This is over an hour of insight. 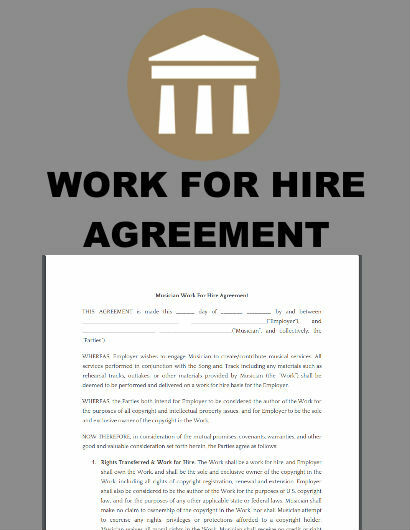 This is a Work for Hire agreement that works perfect for the music business. Though a little lengthy it covers ALL basis and ensures that the contract cannot be broken while also blocking loop holes that could degrade the integrity of the agreement. Perfect for producers that work with musician', writers that work with vocalist, anyone transferring ownership to someone else, and all other popular work for hire purposes. The Text Explanation: Comes with a paragraph by paragraph document that quickly clarifies what each paragraph is saying. Perfect for someone that understands music basics.The Video Explanation: Comes with the text explanation and a video walking through line by line and stories about why certain paragraphs are important. Perfect for someone that wants a deep understanding or a person that would like to be transparent and watch the video with all parties involved. The Text Explanation: Comes with a paragraph by paragraph document that quickly clarifies what each paragraph is saying. Perfect for someone that understands music basics.The Video Explanation: Comes with the text explanation and a video walking through line by line and stories about why certain paragraphs are important. Perfect for someone that wants a deep understanding or a person that would like to be transparent and watch the video with all parties involved.